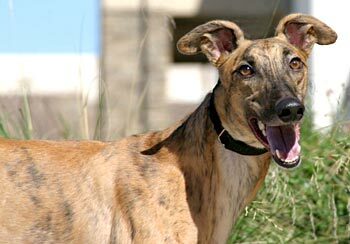 Spanky, aka James J. Braddock, is a good-looking, 2½-year-old brindle male born April 10, 2006. His sire is Greys Outlaw and his dam is LB Lickity Split. 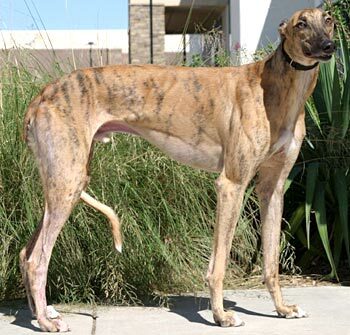 Spanky raced at the Woodlands Race Track in Kansas City, ending on August 10, 2008, when he broke his right hock. Surgery was performed the next day to repair his type 4 central tarsal fracture. Spanky was under the care of the Dallas Veterinary Surgical Center, and his fracture is now healed. 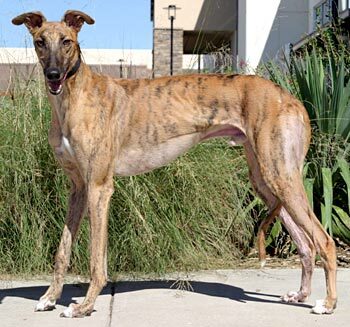 Spanky is living in a foster home with other greyhounds and gets along well with everyone. Spanky's cat introduction: After some time to calm down, Spanky finally lost interest in the cats. At first, it looked doubtful. He was very interested and his gaze couldn’t be diverted. The cats were very spirited and darted all over the house and were totally new creatures to Spanky. Finally, they settled down, commenced with after-dinner cleaning, and acted like he was no big deal. He decided maybe they were no big deal, either. The cats ignored him and walked right by him and he didn’t get excited or even care to follow. When he touched noses with the “fraidy cat” he backed off and looked away. He passed the test. Spanky responds very well to voice correction and seemed to understand what was expected of him after some time in a different house with different critters. As always, we advise close supervision. We will introduce him to small dogs at a later time. I have had Spanky as a foster since late August after his surgery to repair his broken leg. He wore his bandage for approximately 8 weeks and after just a couple of weeks of recuperating out of his bandage, he is as good as new! You would never know he had any type of injury. He toodles around the back yard and runs just like the others. Spanky is one happy-go-lucky guy that is friendly to everyone he meets! He is cute as a bug and quite the clown! He loves to be in the middle of the action, even if the action is lounging on the floor while I watch a little TV. He is elated when it is time to eat and is equally as enthusiastic when it is time to go for a walk! He enjoys squeaky toys and will often toss them around and pounce on them again and again. Spanky is sometime a talker and seems to have quite a story to tell you at times. He does this mainly when he is excited – just after waking up and sometimes around meal time or time to go outside! He is a very loveable boy who gives soft kisses and sometimes a gentle nibble (it never hurts!) to show his affection. Spanky sleeps in the master bedroom at night on a dog bed on the floor. He has never attempted to get on any furniture, although I’m sure he would be happy to if that is something which was allowed. He has been a champ at potty training. He spends the day in a crate while I am at work and many times can be found lounging in a crate while the doors are open. He is a true greyhound shadow and will try to help with many tasks/chores around the house. I just wish he knew how to run the vacuum or mop! Spanky is also a little thief sometimes – some of his favorite things are shoes and hand towels. And he really doesn’t mind if you see him stealing either. I do have to keep my shoes put up or he will consider chewing on them. But in the whole scheme of things that is really not too hard to do. I should be putting them in the closet anyway! Spanky is a joy to foster. If you are looking for a true companion and a dog that will make you smile and laugh out loud, you should really meet Spanky, aka Spanker, or Spank.